I don’t lead an interesting life. In fact, if I weren’t such a klutz I’d be as boring as oatmeal. And not that fancy steel cut stuff with raisins, honey, and brown sugar. No sir. Plain old Quaker oatmeal sans butter. That’s how boring I’d be. Some of my blogging friends provide interesting recaps of their weekly activities, though, and I thought I’d give it a go. Prepare to be underwhelmed. Finished reading the sci-fi/fantasy series, Shadows of the Apt by Adrian Tchaikovsky. Tomorrow’s post will provide a review for any geeks out there. Began reading The Expanse series by James S. A. Corey. So far, so good! I hear it’s been made into a television series. Studly and I finished watching “Hell on Wheels.” I cried because it ended perfectly and because I’m sad that it’s over. Watched the U.S. team lose to the Europeans in the Ryder Cup. Damn. Studly bought a new sport jacket and I helped pick it out. Actually I just stood there and did my best to discourage any bad choices. He did well. Bought a new pair of jeans. That must mean fall is here. Shopped the amazing sidewalk sale in downtown Thomasville, Georgia, but only bought myself lunch–a beautifully made grown up grilled cheese sandwich at Sweetgrass Dairy. Yum! Fished my favorite necklace out of the dumpster. Spent one day watching the testimonies of Dr. Ford and Brett Kavanaugh. Some of those senators need to be sent to bed without supper. Lindsey Graham should be grounded for a year. Kavanaugh doesn’t have what it takes to be a Supreme Court Justice. I’m sure I did other similarly non-fascinating stuff, but I didn’t sleep much last night, and a nap seems like a good idea at this time. 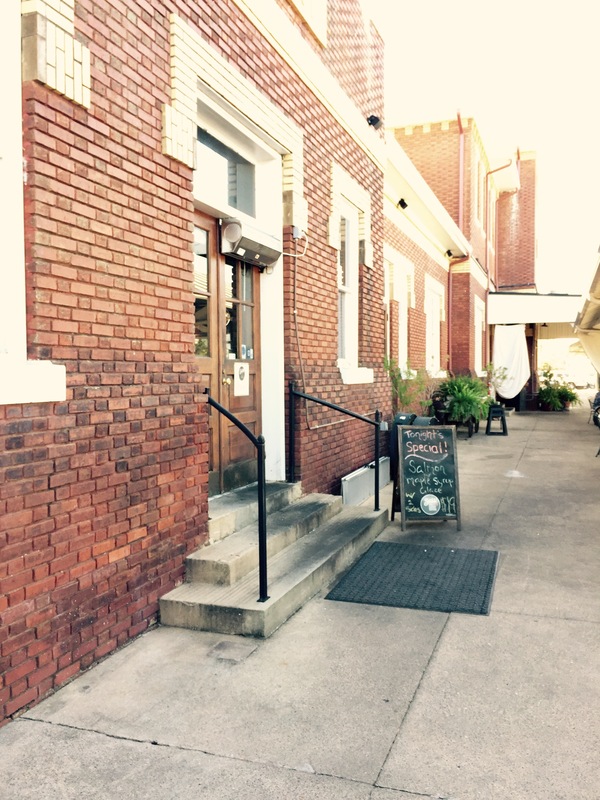 I enjoyed shopping in Thomasville, Georgia, on Friday even though I didn’t find what I was looking for. Instead, I found this guy hanging around outside a taxidermy shop. I think I’ll call this one, “Oh Deer!” I wanted to call it, “Moose on the Loose,” but Studly stopped me from making that mistake. A good editor is priceless. On Friday I drove to Thomasville, Georgia, just under an hour north of Doright Manor. I didn’t think to take any photos until I came across this car. I think it’s a Packard, but didn’t get close enough to tell. Here’s a closeup of the front end. Maybe someone can help identify the make and model. In Monday’s post I recounted the tale of a trip to Birdsong Nature Center outside of Thomasville, Georgia. My friend, Lee Ann, was visiting from Indiana, and we wanted to explore the beauty of nature while enjoying a good hike. Birdsong was the perfect place to indulge our wishes. Of course after our four mile hike we were hungry, and I suggested that we drive into Thomasville to enjoy a meal at Jonah’s Fish and Grits. Jonah’s is always a great choice. Unfortunately everyone else in the area had the same idea, and the line for Jonah’s snaked down the sidewalk. 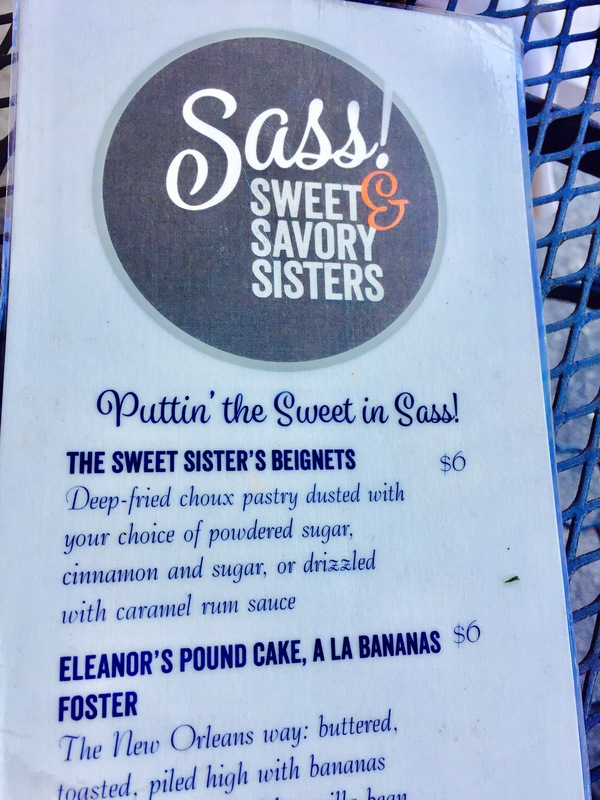 My first inclination was to go on back to Tallahassee, but on our way out of town we saw a sign for Sass! 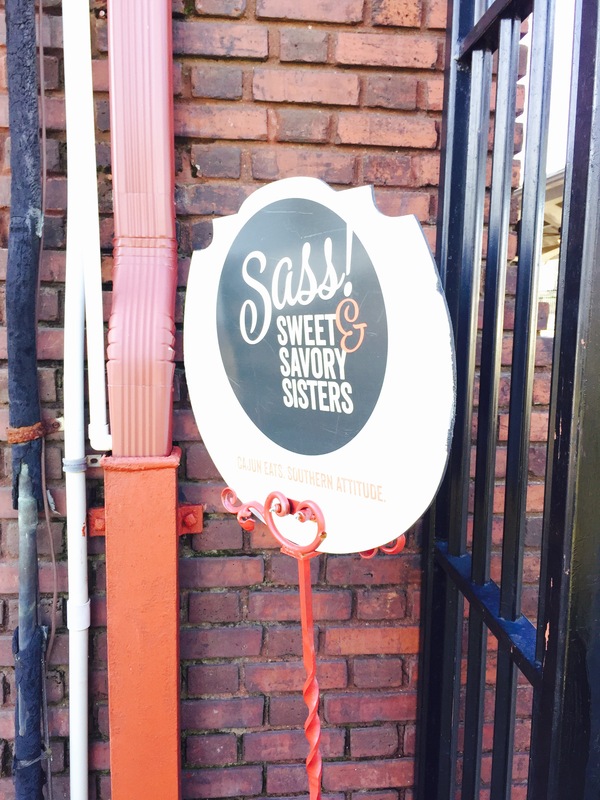 Sweet and Savory Sisters Restaurant. I’d seen their sign before, but didn’t have any knowledge of their fare. I quickly consulted Lee Ann and with her approval I made a sharp turn into Sass’s parking lot. 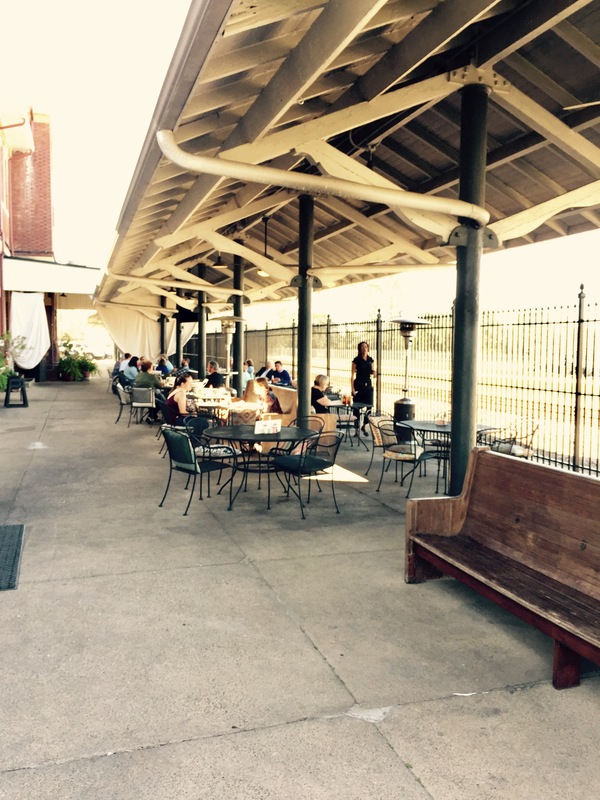 Sass is located inside a historic train depot and outdoor seating features a ring side seat to actual train tracks. I remarked, in a necessarily loud voice, that Sass would be the perfect place to bring someone with whom you didn’t want to make meaningful conversation. 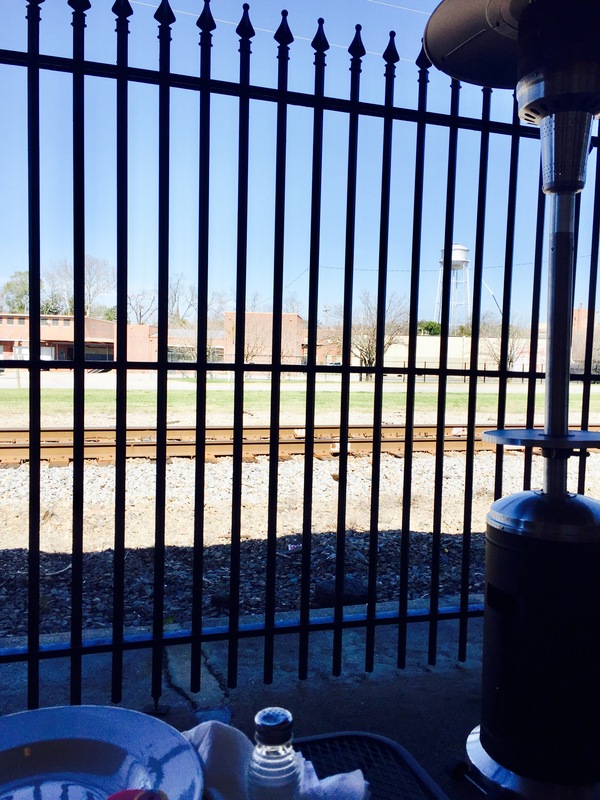 But all joking aside, Sass was a terrific lunch spot. The staff was lively and efficient and the menu included everything my dreams are made of including beignets! 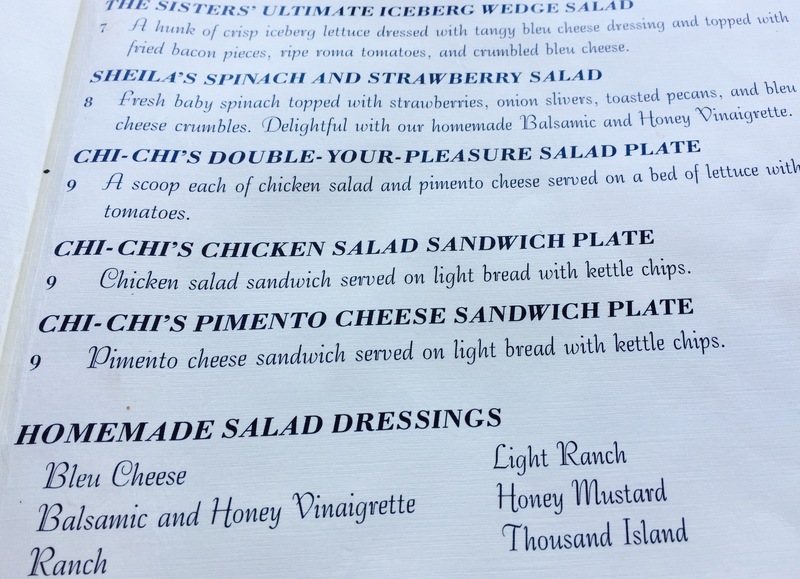 Lee Ann ordered a strawberry, walnut, and spinach salad, while I ordered a couple of appetizers: mini tomato sandwiches with dill mayo and baked pimento cheese on French bread. And it goes without saying that we enjoyed the beignets for dessert. Oh my! What a great meal to celebrate our visit. And I highly recommend Sass. Yes, Jonah’s is good, but Sass is its equal. 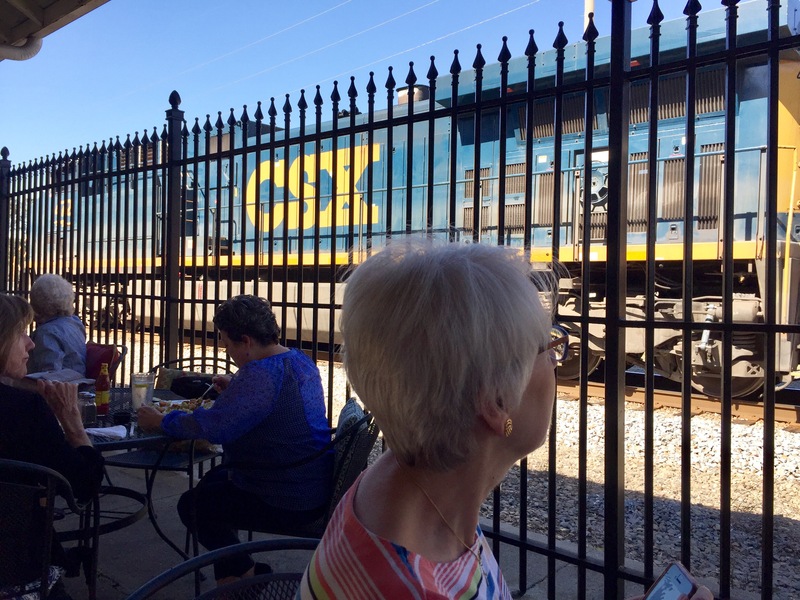 Different fare, but both worthy of a trip to Thomasville. 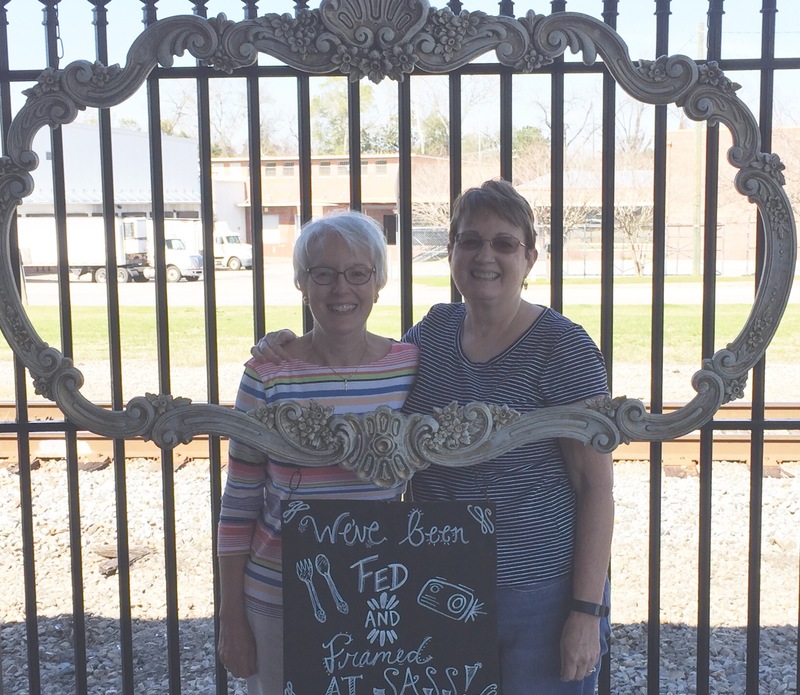 A brand new friend and I drove over to Thomasville, Georgia, yesterday to shop and have lunch. It was a superb day even with the rain that fell sporadically and the growing realization that my hips have grown wide enough to qualify for their own zip code. My friend knows the area, so she was my guide as we peeked into gift shops and boutiques and even a funky taxidermy establishment. Heavenly seafood and grits to die for! 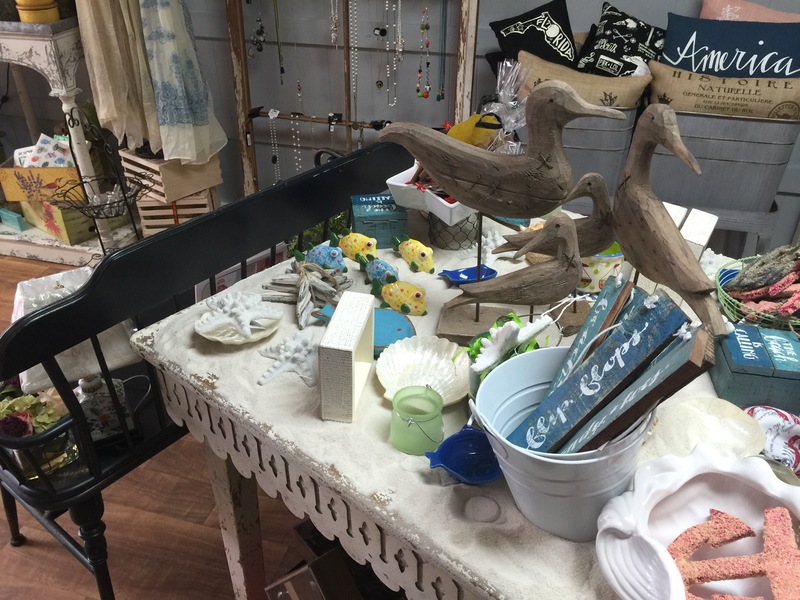 After a lunch of Jonah’s spicy Cyclone Shrimp and a Caesar salad we wandered into the cutest little shop. You probably can’t tell, but the table top had a layer of sand on it! Perfect for a summer beach themed display. I should’ve taken more photos, but as we browsed I realized that after several minutes no watchful shop attendant had come out to greet us. A pair of high school aged girls stopped by the store and we learned that one of their teachers owned the business. We continued looking around and visiting for awhile and then the young ladies left. Now, I’m a huge fan of shows like Crime Scene Investigation and Criminal Minds, so naturally I began to believe that the shop’s owner had come to some harm. Perhaps as we’d been innocently examining the goods in her shop she’d been lying in a pool of slowly congealing blood, scratching the initials of her assailant in the viscous red liquid in hopes that her murder will be solved and justice served. With that scenario in mind, I boldly strode to the work area of the store and yelled, “Hello? !” No answer. I looked under a workbench and behind a counter. Nothing. No one. My new friend was beginning to get a bad vibe. About me. I can tell these things–it’s why I can count my friends on one hand and still have two fingers left over. Reluctantly, we left the store, but I wasn’t through. I went to the shop next door and explained my concerns to the two ladies working there. I was relieved and a bit flabbergasted. Who leaves a shop unattended in the middle of the day? Or at any time, for that matter. 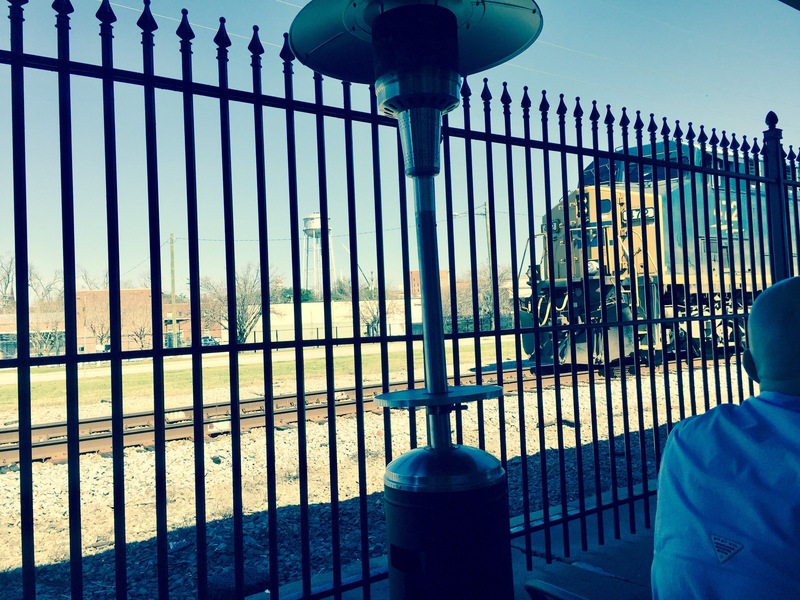 Granted, Thomasville isn’t a large city, but it is certainly big and busy enough for there to be ill-intentioned people lurking about. My (still?) friend and I left feeling a measure of relief and continued shopping. She bought a couple of cute tops and I bought a natural mosquito repellent. That’s what one buys when one’s hips have become their own 90210. I fully intended to return to the unattended shop before leaving Thomasville, but a rain storm burst from the heavens and put an end to our stroll about town. Perhaps on my next visit I’ll stop in to see who this most trusting of women is and spend a few dollars in her shop. I had a strange affinity for those wooden seagulls.